Some uk casinos are running recurring promotions every week and one casino that does exactly this is Guts. If you're not familiar to Guts we can tell you that this is an established online casino operated by Gaming Innovation Group. Other well known casinos in this group are Betspin and Rizk. And the best part with these casinos are that the brands are running on an own platform called iGaming Cloud. And this is actually a company within GIG. So everything at these uk casinos runs very smoothly and we have never experienced a problem on either Guts, Rizk or Betspin. If you want to give Guts a try yourself you can do this this Thursday when there is a fantastic promotion running in the casino. 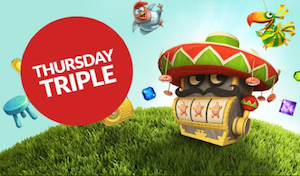 We are talking about the Thursday Triple that includes loads of free spins that you can get today! Every Thursday players at Guts can visit the casino to claim some free spins for the weekend. The best part with these free rounds is that there are no wagering requirements attached. This means that if you win anything on your spins you are able to cash out everything straight away! This also makes Guts' offers more valuable than similiar offers at other well known online casinos. This Thursday Guts is giving you the opportunity to claim up to 60 free spins without wagering requirements. There are two options for you this day if you want a bunch of free rounds for the weekend. You can either deposit and wager at least £20 during the day to get a total of 30 free spins. If you choose this offer you will get 10 rounds per day between Friday and Sunday. 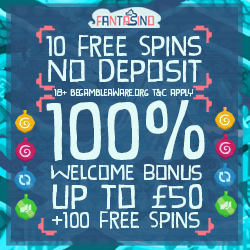 If you're looking for even more free rounds you should deposit and wager £50 or more during the day. This action will entitle you a total of 60 free spins which you will get during Friday, Saturday and Sunday. The first free rounds can be used tomorrow by 11 pm and the spins are valid for you on The Wild Chase. Parallel with the Thursday Triple Guts is also running a Euro 2016 casino trivia. In this trivia there are loads of valuable prizes to get such as free spins, cash, bonuses and other secret valuables. Every day during the Euro 2016 casino trivia you can login to Guts to answer a question. A correct answer to the question will give you some points that can lead you to very valuable prizes. You will also get a mission to complete to get even more points. Every day you participate in the casino trivia you will also be rewarded with some free spins no deposit or a nice reload bonus to use in the casino. All information that you need to join this promotion are gathered on Guts' promotion site. At this site you can also read about the generous welcome offer that actually includes free spins no deposit for new members that joins the casino!